I’ve always loved Batman. He wasn’t my first love, that was Supes, but early on I grew to love the man in black…or gray…or blue – depending on when you started reading the comics. So of course, when “Batman Begins” came out in theaters “it was on like Donkey Kong”. While the movie was phenomenal, what comes to mind as I look back on it now was how badly I wanted gauntlets. Not multiple copies of the awesome arcade game, but a pair of gauntlets equipped with razor sharp protrusions along the edges. 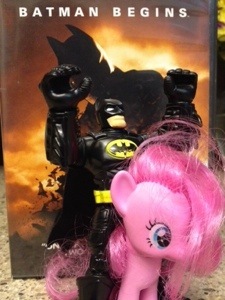 I was quite certain that with a pair of gauntlets and the training of Liam Neeson, I too could be as awesome as Batman. As soon as we left the movie theater in Waco and said our goodbyes to our good friends John and Amy, I went home and cut a pair of socks into gauntlets (and a nice pair of homemade ankle socks to boot). They might have been soft and harmless, but they gave me the confirmation that all that was keeping me from being even more awesome than my current state of awesome was a pair of ninja-esque leggings for my arms. Of course, my potential awesomeness was directly correlated to how awesome I perceived the first Nolan Batman film to be. Or, more correctly, it was correlated to how awesome Christian Bale was as Batman. Later that summer, I took my brother and sister-in-law to see the film while we were vacationing together in Florida. I wanted my brother-in-law to like it. But more importantly, I wanted him to agree with me about how awesome Christian Bale was as Batman. Not only was he “the best Batman of all times forever”, but he was so good as Batman that it was a pretty clear indicator that he could physically dominate any other actor in Hollywood. Me: I mean, can you believe how crazy tough this new Batman is? Him: Certainly seems pretty cool and tough. Me: I think Christian Bale could beat all the other Batmans (Batmen?) combined in fisticuffs. Me: I mean, come on, he’s got to be the toughest, strongest actor in Hollywood right now. I think he could beat anybody. Him: What about Sean Penn? Me: Come on, Sean Penn? I mean he’s got to be so much smaller than Christian Bale. What is so remarkable about Bale is that he is the first to really get Batman’s physicality. Him: Are you sure Bale’s bigger than Sean Penn? Me: Sure. He’s got to be. Him: But you’re forgetting something. Him: Sean Penn is crazy. Looking back, I realize a number of things. First, we now know that Christian Bale can be just as crazy as Sean Penn. Second, crazy is relative. Third, this was a pretty colossal waste of energy. I’m not saying that argument for argument’s sake is not a valid pastime. My roommate in college and I used to spend hours debating who would win between Indiana Jones and Han Solo (it really all depends on whether guns are involved, but Harrison Ford always wins our hearts). And there are plenty of good ways to debate fun and nerdy things. But what I’m concerned about is the energy behind the debates and arguments. The internet culture of trollism has turned the shaming of those who have different ideas than us into a national pastime. We’ve all become critics who are so wrapped up in wanting other people to agree with us that we forget that there are human beings on the other ends of our comments. This phenomenon has spread outside the bounds of the internet. We find ourselves drawn to various ideologues in the realms of religion and politics who are more concerned about ratings and popularity than they are about the plight of humanity. No, I’m thinking about moving away from arguing about things with any sense of energy and moving to arguingfor those whose voices might not otherwise be heard. I’m still open to debating whether Gredo or Han shot first, but I’m not willing to put any energy behind it anymore. There are far more important things. Nor am I suggesting that without my help otherwise disenfranchised groups would have no hope. I’m not that imperialistic in my thinking. But I am thinking that if I spend all my energy arguing about things so that people will agree with me then I won’t have any energy to speak up and argue for people and causes when it really counts. Those of us who have some amount of power, however small it may be, in the systems in which we exist, have a responsibility as human beings to use that power to effect positive change for the world and our brothers and sisters. Those of us who profess to follow the way of Christ have an even greater responsibility to care for “the least of these”. We must become aware of the way in which we are spending our energy, making sure we have enough energy left to use it when it really matters most.